A California Air National Guard HH-60G Pave Hawk rescue helicopter with air crews and two Guardian Angel pararescuemen from the 129th Rescue Wing Moffett Air National Guard Base, Calif., provide search and rescue operations after Southern California mudslides, Jan. 10, 2018. 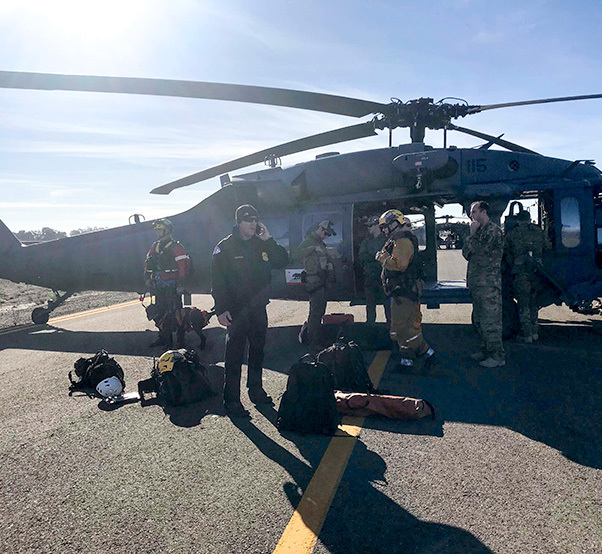 California Air National Guardsmen from the 129th Rescue Wing, Moffett Air National Guard Base, Calif., are providing search and rescue support in Southern California for those impacted by the recent mudslides. 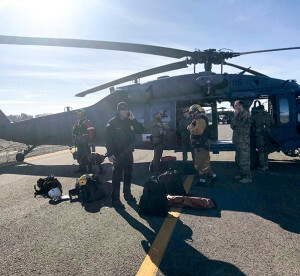 The 129th Rescue Wing has deployed an HH-60G Pave Hawk Helicopter with air crews and two elite Guardian Angel pararescuemen to Santa Barbara Municipal Airport and are performing search and rescue operations in the surrounding areas adversely impacted by the recent mudslides. The aircraft is one of eight California National Guard aircraft and a dozen high-water vehicles supporting mudslide-response efforts. 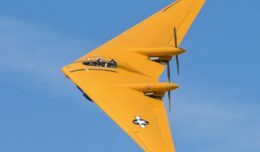 The California National Guard and the 129th Rescue Wing are working closely with the Santa Barbara Sheriff’s Office and stand ready to send additional personnel and resources as needed. Over the last few months, hundreds of these Silicon-Valley based Airmen deployed to support relief efforts in Texas for Hurricane Harvey, in Florida for Hurricane Irma, in Puerto Rico for Hurricane Maria and in California for the Wine Country Wildfires and the Thomas Fire. The 129th Rescue Wing is credited with saving the lives of more than 1,100 people since 1977. From arid deserts and snow-covered mountain tops to urban and rural settings, 129th Rescue Wing Air guardsmen can reach any destination by land, air or sea. Equipped with MC-130P Combat Shadow aircraft, HH-60G Pave Hawk rescue helicopters and Guardian Angel teams (pararescuemen, combat rescue officers and SERE Specialists), the 129th Rescue Wing conducts combat search and rescue missions, as well as the rescue of isolated persons on board ships, lost or injured hikers, and medical evacuations across the West Coast.